MANILA, Philippines – (UPDATED) The De La Salle Lady Spikers fired on all cylinders for nearly the entire game to overpower University of Santo Tomas in four sets, and secure a berth in the Finals of the UAAP Season 79 women's volleyball tournament. Behind a superb performance from setter Kim Fajardo and their overwhelming net defense, the Lady Spikers came away with a 25-14, 25-20, 24-26, 25-13 in their Final 4 showdown against the Tigresses at Araneta Coliseum on Saturday. 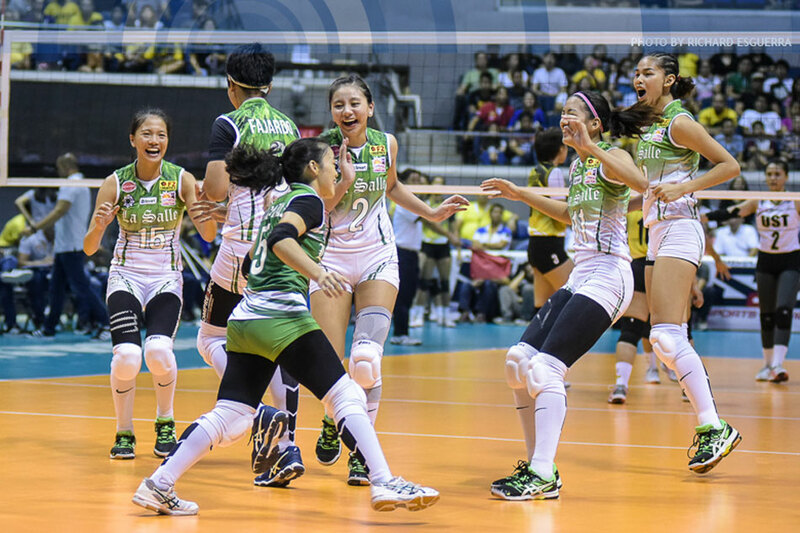 The victory ensured that La Salle will march to the women's volleyball Finals for the ninth consecutive season, while UST saw its return to the Final 4 become an all too brief stint. "Last year, 'yun ang talagang ine-expect ko na papasok ng Finals. Pero this year, sinabi ko na maraming nawala. Siguro, gusto rin nila na patunayan sa sarili nila na wala na si Mika Reyes, wala na si Ara Galang, wala na si Cyd Demecillo, so kailangan nila i-cover 'yung mga positions na nawala," said La Salle coach Ramil de Jesus. "And andiyan naman din 'yung setter, so kung ano 'yung galaw last year, siguro mas kayang lampasan kasi andiyan naman 'yung setter, na nagi-improve pa."
The Lady Spikers easily took the first and second frames, thanks in part to their remarkable blocking. In the second set alone, La Salle registered seven kill blocks, while also committing only three unforced errors. The tide turned in the third frame, when UST ran out to a 5-1 advantage due in part to consecutive miscues by the Lady Spikers. Unfortunately for the Tigresses, disaster struck when star open hitter EJ Laure twisted her right ankle upon landing, after successfully bothering a Kianny Dy spike. UST led 7-3 at that point, but lost one of its primary scorers when Laure was helped to the bench. It marked the second straight game that the former Rookie of the Year suffered an ankle injury; she also twisted her foot in their final game of the eliminations against National University last week. With Laure out, the Lady Spikers made their move. Majoy Baron again established herself as a force at the net, blocking Chloe Cortez's kill and scoring on a quick hit to put the Lady Spikers on top, 13-12, for their first lead of the set. La Salle would go up 15-13 off a spike from Tin Tiamzon when Laure made her return, having gotten her ankle iced and taped. She scored on an off-the-block hit almost immediately, and her gutsy performance clearly fired up her teammates. No one was more inspired than UST skipper Sisi Rondina, who came through with huge hits in the third set after repeatedly getting denied by the La Salle blockers in the first two frames. Ria Meneses also came up big, and her rejection of Tiamzon put the Tigresses on top, 23-19. A crossing violation by Dy put UST at set point, 24-21, but the Lady Spikers saved three set points thanks to Baron and Tiamzon. The Tigresses would not be denied, however. Shannen Palec's swipe off the La Salle blockers gave them their second set point, and Rondina finished off the frame with a spectacular attack that punched through La Salle's three-woman wall. "Isang factor 'yung (injury ni Laure)," De Jesus said of their third set meltdown. "Biglang labas, pasok, tapos 'yung crowd, andoon. 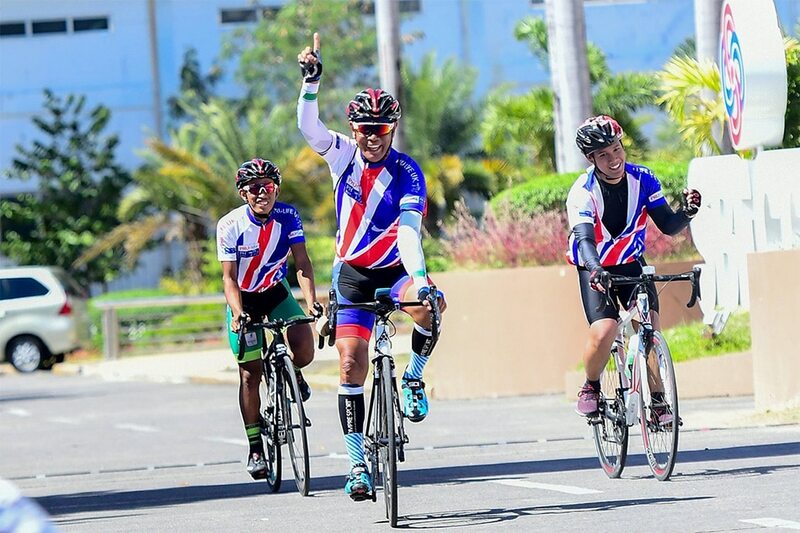 May mga times kasi na hindi naman sa UST nanggagaling 'yung problema – sa team namin mismo. Biglang hihinto. So 'yun ang dapat magamot pa ng team." The Lady Spikers regained their bearings in the fourth frame. Behind Fajardo's heavy serves, they raced to an 11-1 lead and never looked back. Fajardo was named Player of the Game after tallying 11 points built on five aces, along with 39 excellent sets. Baron topscored for La Salle with 17 points, including four blocks, while Aduke Ogunsanya scored six of her nine points on kill blocks as well. As a team, La Salle registered 17 rejections to only eight for UST. The Lady Spikers also came through with 11 aces against only one for the Tigresses. Rondina finished with 16 points, while Laure added 14 markers. However, the Tigresses were outgunned in nearly every skill, and their floor defense and reception simply could not keep up with La Salle's offense.